In a recent article by N. D. B. Connolly, an assistant professor of history at Johns Hopkins University, diffusing the myth long carried in the streets, Town Halls, and homes of white Americans – that Black Culture is to blame for their widespread poverty – a significant number of heated debates have ensued, mainly between the ‘personal responsibilitors’ and opponents of the racist capitalist white American culture. After several protests in major cities in America in solidarity with victims of white police brutality, broad polls conducted across America paint a consistent picture of what white Americans have come to believe is a lack of personal responsibility in Black America. Even poor white Americans believe that more recent African American deaths at the hands of white cops – Freddie Gray, Michael Brown, Tamir Rice, Eric Garner etc. – are a result of Black personal irresponsibility. These responsibilitors, led by Fox News, claim bitterly that the lack of jobs in Black neighborhoods and the high unemployment rates in African American communities can be explained away by a lack of Black personal responsibility. The ignorance in this comment needs not mentioning, but it underscores a deep seated problem in white America. No! Inner city children, I presume Black children, are not on a nationwide taunting of their fellow brilliant mates. That is a categorically false presumption. Even if that were true, any sociologist can affirm that discrimination against Black students, which has been widespread in America since Jim Crow, is rather the culprit for any alleged inaction in Black communities. Taunting as a tool does not translate into a people’s enslavement nor does it imply their mass incarceration by white judicial systems! That such a comment on the New York Times is the most liked – has received several hundred recommendations – paints a deepening crises in white America. A crisis of the perpetration of falsehoods and the lack of personal responsibility that the belief in these lies enhance. And no! There has not been a 50 year war on poverty in America. If that was the case, well, the reality paints quite a contrasting picture to that belief. Instead, what surely has happened in America has been a 50 year war on Black America – putting African Americans in prison for absolutely no law enforcement reason. The coonery and the buffoonery in this comment, the second most liked New York Times comment, show the extent of misinformation and the depth of racism in white America. It also shows the complete and intentional disregard for facts and fact checking in white America. These kinds of reckless distortion is the cancer that has eaten away any serious consideration for white America to take personal responsibility for their actions and the country they live in. How about white Americans start acknowledging the horrors of slavery and the atonement needed thereof? How about white Americans start a compensation for the sins of Jim Crow, the brutality of Segregation and the callousness of the mass incarceration of whole African American communities? Even more granular, how about white Americans take care of their own children? As in breastfeeding them and walking them to their morning prayers at school? One poll conducted by the Innocents of America shows that more than a quarter of white Americans above the ages of fourteen have been breastfed at least once by another woman outside their race! Why? White America, accounts for only 4 percent of the world, but consumes over 50 percent of the world’s resources and produces over 50 percent of the world’s wastes and still deny that there is Global Warming? Why? How about white Americans start taking some personal responsibility? For so much about a war on poverty, obviously a self-aggrandizing slogan passed along the dining halls of white America, it is clear that America has failed the world. They have failed their own citizens! More people go to bed hungry in the United States of America, the richest country in the world, than any part of the world. Perhaps, white America do not need to fight poverty anywhere. Rather the world needs to stop white Americans from consuming so much and wasting too much. Or perhaps, white Americans themselves can start taking some personal responsibility? Marketplace food portions in white America alone have increased in size and now exceed even the Federal Standards. Portion sizes began to grow in America in the 1970s, rose sharply in the 1980s, and have continued in parallel with increasing body weights of white Americans. Nothing in the so-called economic system that white Americans seem to be so proud of, that has so-called propelled other ethnic groups to success in America, have been based on sound judgment or economics, nor has it been based on an craving for efficiency. Rather, they have been based on exploitation, racist capitalism and an insatiable hunger for the world’s resources! That has to stop! And it must start with white Americans taking personal responsibility for their lives and for the world they live in! Breastfeed your own children for a start. In fact, mother them yourselves for a start. Do your own laundry, stop misusing other people’s labor and machines for menial chores for a start. Stop cheating and playing rigged games on Wall Street for a start. Stop going to war with people who refuse to hand over their food for free to you! Stop killing people who disagree with your worldview. In fact, stop the current Jim Crow in America – stop incarcerating every Black man you just don’t like; stop police extortion from African Americans; stop your race war mongering and stop lying and fabricating misinformation too. Perhaps what white American children should be asking their parents is how the over-gluttonous demand and appetite for consumption are going to be met in a future where they are going to be stupider? That is a more useful problem exacting consideration than the excitement generated in white America every now and then about Black personal irresponsibility when white cops obviously shoot and kill African American men for absolutely no law enforcement reason. The problem is not black culture. It is white policy and white politics, the very things that bind together the history of Ferguson and Baltimore and, for that matter, the rest of America. Specifically, the problem rests on the continued profitability of racism. 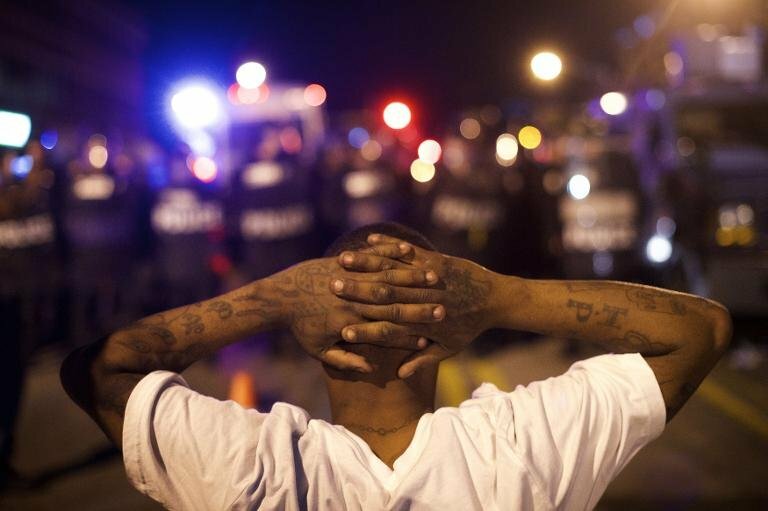 Freddie Gray’s exposure to lead paint as a child, his alleged participation in the drug trade, and the relative confinement of Black unrest to Black communities during this week’s riot in Baltimore are all features of a city and a country that still segregate Black people, to the financial enrichment of white landlords, white corner store merchants and other white vendors selling second-rate goods who refuse to take personal responsibility for themselves except to exploit and dehumanize others. The problem originates in a white political culture that has long bound Black bodies to questions of property. Slavery was not only a labor system. It was a property regime, with Black bodies serving not just as workers, but as commodities. Whites routinely borrowed against Black bodies. They took out mortgages on them. As a commodity, the slave had a value that the state was bound to protect. Now housing and commercial real estate have come to occupy the heart of white America’s property regime, replacing slavery. And damage to real estate, far more than damage to ostensibly free African Americans, tends to evoke swift responses from the state. What white America refuses to prosecute, however, is the daily assault on Black people through the slow, willful destruction of real estate within Black communities. The conditions in West Baltimore today are the direct consequence of white exploitative and speculative real estate practices that have long targeted African Americans who have been incarcerated for absolutely no law enforcement reason. On the heels of any ghetto economy based on extraction comes the excessive white police force – gangsters and thugs really – necessary to keep every Black man in place. Cities that are starved for income have found ways to raise revenues by way of fines and fees exacted from poor, underemployed African-Americans. These include property taxes and court costs. In Maryland, in particular, these come in lieu of property taxes that many of the state’s largest white American employers are not required to pay. The dangers of tax burdens and other unseen costs are as deadly to urban households as white police brutality. So, all the hullabaloo about personal responsibility in Black neighborhoods is more the distraction that white gangsters, hoodlums and thugs so entrenched in the racist American Judicial System want to emphasize. But, to date, who has been more irresponsible in America? It is certainly not Black America! White America, not Black America, needs taking personal responsibility. Thank you for starting this much-needed conversation. I personally am tired of white America pointing the finger at everybody except itself. Their consumption and fracking is causing global warming and climate changes. Their unnecessary violence is killing the world’s people–from Native American genocide to hangings in slavery to murders through the death penalty, police killings of Blacks, and through terror of Black communities and communities all of the world, in Africa, the Middle East, the Caribbean, and South America. All signs point to no personal responsibility for white Americans and it is no surprise here that the gang leader of white media, the New York Times, never takes journalism seriously enough to take personal responsibility for white crimes against humanity. Yes, White America please stop the madness! Some of us would like to live in peace.